On 11th March 1888 Ballinrobe's opponents that day were from Tuam and the match was played in a field in Tuam lent by a Mr. Edward Concannon. Unfortunately, Ballinrobe were defeated 1-0 on this occasion. The "Old Footballer" wrote that "through a long experience in field games, I have never known a better spirit of fair play than that exhibited in Tuam". However, another local reporter violently disagreed; "Scrutator" described the Ballinrobe men as "tough, rough customers". Indeed, it was stated that at football training during the following week only eight of the twelve players on the Tuam team were able to turn out because of injuries. L.P. Gibbons of Tuam refereed the match and as Ballinrobe had not brought an umpire with them, Michael C. Shine acted as umpire for Ballinrobe while J.B. Joyner was the regular Tuam umpire. The Ballinrobe men were feted in the local hotel but the Tuam team declined an invitation to replay in Ballinrobe and no return match was ever played. According to Noel O'Donoghue in his book, ‘Proud and Upright Men', Ballinrobe fielded an association football team as far back as the 11th March 1888. To put this into context, 1888 was the same year as the Football League was founded in England and indeed many of the top English sides we are so familiar with nowadays were not even in existence at the time. Likewise, the League of Ireland's oldest club, Bohemians F.C. were not founded until 1890. The next mention of association football involving a Ballinrobe team is contained in The Ballinrobe Chronicle, a local newspaper which was in existence from 1866-1903. It states that on the 21st December 1895 a match took place between Castlebar and Ballinrobe, no score line is recorded. The match programme from Ballinrobe Town's meeting with St. Michael's of Ennis in the 5th round of the 1970/71 F.A.I. Junior Cup states that as far back as 1896 Ballinrobe had a soccer team called the "Blues & Whites" who remained unbeaten for three whole seasons. Again, according to the Ballinrobe Chronicle a general meeting of the association football club was held in the Town Hall on the 29th September 1900 with J.B. Staunton presiding. He was also elected Captain with Thomas Monaghan elected as Treasurer and P. Morris elected as Secretary. Committee members were P.J. Donnellan, J.J. Donnellan, James O'Shaughnessy, Francis Kelly, P. Feerick and Francis Connolly. On the 21st March 1901 a match was played between the Ballinrobe "Major McBrides" and Ballaghaderreen "Faugh a Ballaghs". The Ballinrobe team was Caulfield in goal, Kelly and Shaughnessy were selected as full backs, Tierney, Gannon and Monaghan as half backs, and Fallon, Maglone, Fitzpatrick, Staunton (Captain) and Moffat as forwards. The result was a scoreless draw. The following month on the 25th April 1901, there was an association football tournament played in Ballinrobe at which Ballyhaunis played Castlerea. Ballaghaderreen were again supposed to play Ballinrobe but they failed to turn up. As a result, after the Ballyhaunis v Castlerea match Ballinrobe played a selection of players picked from both of those teams and ran out winners on a score line of 4-0. The Ballinrobe team on this occasion was Caulfield in goal, Kelly and Shaughnessy were again selected as full backs, Tierney, Gannon and Monaghan as half backs, and Fallon, Maglone, Fitzpatrick, Staunton (Captain) and Donnellan as forwards. On the 2nd January 1902, a game was played between the Ballinrobe "Major McBrides" and Westport. The team selected was Caulfield in goal, Kelly and Shaughnessy as full backs, Tierney, Gannon and Moffat as half backs, and Fallon, Maglone, Daly, Staunton (Captain) and Donnellan as forwards. Fallon scored the first goal for Ballinrobe and Staunton the second. Maglone, Moffat and Daly scored one apiece in the second half with the result that Ballinrobe triumphed 5-1. The Chronicle reported on the 6th February 1902 that there was to be an association football tournament in Castlerea on the 16th. The Boyle "Freebooters", the Ballyhaunis "Young Irelands" and the Ballinrobe "Major McBrides" were also to take part. Two weeks later on the 20th February, the leading article states that the Ballinrobe footballers journeyed to the tournament by special train accompanied by the brass band and returned home with a sweeping victory. The team ran out 5-0 winners over their Castlerea counterparts. It seems the Ballinrobe team of this era were quite successful by all accounts, in fact just a few weeks later on the 13th March they again overcame Westport, this time by a scoreline of 4-1. They even had the distinction of playing English side, Everton F.C. in 1904. As noted earlier, the Ballinrobe Captain during this period was J.B. Staunton and indeed he was in attendance at the St Michael's match played in The Green in 1970. Interestingly, Everton F.C. went on to finish runners-up in the English Football League Division 1 for the 1904/05 season. Front Row l to r: John Fallon, George McLeon, John B. Staunton (Captain), Thomas Fitzpatrick, James Donnellan. 2nd Row: Patrick Gannon, Tom Monaghan, Tommie Tierney. 3rd Row: Henry Caulfield, Grand Kelly, James Shaughnessy. Also included are Peter Lydon, Paddy Donnellan, Frank Connolly, Paddy Moran, Paddy Feerick, HermanValkenburgh, John Moran and Peter Morris. 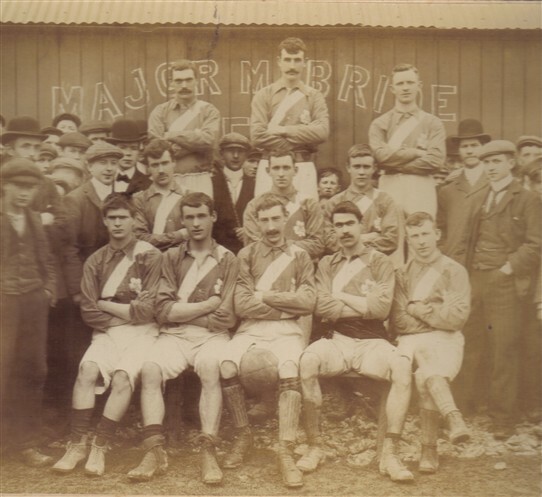 Ballinrobe Major Mc Bride Football Club, pictured in 1901. This page was added by Averil Staunton on 05/03/2011. What a nice surprise to see a photo of my grandad Peter Morris! (Secretary of the Football Club, standing far right, hand in trouser pocket.) His son, Seamus, born 1924, in Abbey Street, Ballinrobe is my father. After being in the Irish Guards during the 2nd World War, he settled in England but was always extrememly sentimental about his Ballinrobe roots! He died last year at the age of 85 and his ashes were taken to Balinrobe where a funeral was held and he is buried alongside my mother (originally from Donegal) in the cemetery set in the grounds of the old Augustinian monastery where several generations of Morrises are buried.